We will gather at Nighthawk Chicago and start the ride at 1pm. Come earlier for a cup of coffee or another quality drink. 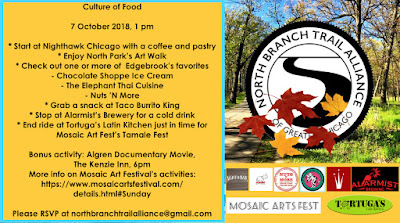 We will ride to the corner of Kimball and Foster for a stop by the North Park Art Walk - part of the Mosaic Arts Festival. 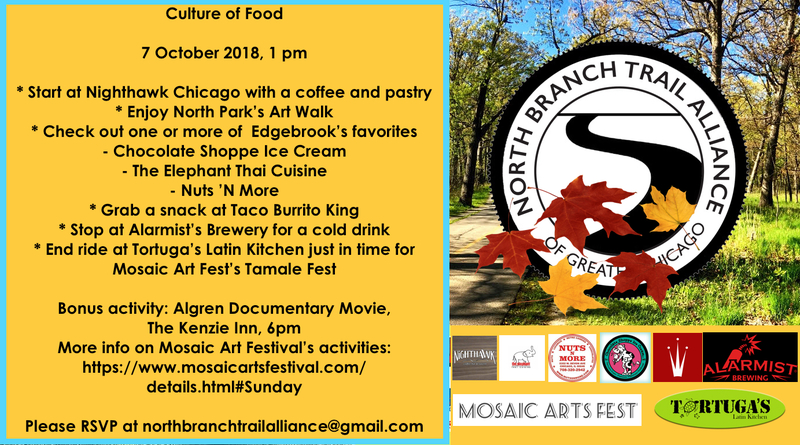 From there we'll continue to Edgebrook and check out one or more favorite destinations right off the trail - Local Goods, Elephant Thai Cuisine restaurant, Chocolate Shoppe Ice-cream and Nuts' N More. The ride will continue north to Taco Burito King, suggested by fellow NBTA riders, and then we will head back South towards Alarmist Brewery for a cold beverage. Finally, we will end the ride at Tortuga's Latin Kitchen, just in time for The Mosaic Arts Festival's Tamale Fest. We kindly encourage you to patronize the NBT Alliance business partners and show some love on Social Media. 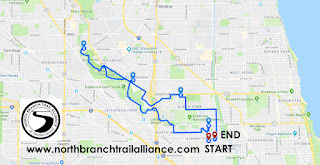 If you would like to volunteer at this or a future NBTA ride, we would love to hear from you! We kindly thank North River Commission for connecting us with Mosaic Arts Festival.